Having to post from my phone as the dog is on my lap and there's no judging her. She may be small but she's stubborn. 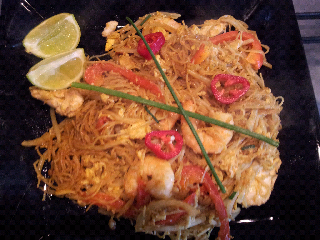 I always have Singapore noodles when we have takeaway but wanted to look for a recipe that was far less greasy than the ones I normally get. Pound for pound in cost the homemade ones were probably only slightly cheaper but hopefully so much healthier than takeaway ones. According to the recipe its less than 300 cals per portion.